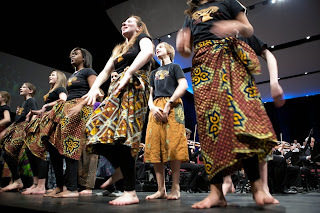 Baobab Youth Performers spent a wonderful day on Saturday February 20th onstage and offstage at the National Arts Centre with the NAC Orchestra under the direction of conductor Boris Brott. Joined by some of the ROOTS kids, our large group of drummers and dancers had a terrific time rehearsing on stage with the orchestra and members of the Ottawa Children’s Choir & the ORYC, hanging out in Rehearsal Hall A, buying stuff from the performers cafeteria and playing to large crowds at the two afternoon shows. They performed “Gahu Songs” an arrangement for orchestra by William Cahn (of the percussion ensemble NEXUS) of the traditional Ewe Gahu that Kathy Armstrong arranged and taught to the choir members. Hearing the violins, basses, trumpets and other instruments playing the familiar Ghanaian melodies was an unusual and exciting experience for us all. Also on the show was the funny and charming Eugene Levy, who took a few moments with the youth at the end of the performances to pose for a few pictures and have a chat. A few autographs were obtained as well. It was an honour to be chosen to perform on this special show with the orchestra. Happy Birthday NACO!!! Check out this cool slide show put together by Rory Magill of our meeting with Eugene Levy, featuring kooky urban honk horn music from Ghana.